There's not much to Boon Island. No soil, no vegetation--just the hellish storms and a strip of jagged rocks waiting to rip open a passing ship. It's an impossibly inhospitable place that witnessed a cannibalism incident in 1710 when the Nottinham Galley ran aground, and the survivors had no way to get to shore. The first two lights built on Boon Island were swept away. In 1852 the tallest tower in New England was built-- 137 feet of massive granite blocks. Of all the choice lighthouse keeper assignments in Maine, this was not one of them. And yet, keeper William W. Williams served on Boon Island for 27 years. The light was still manned until the Blizzard of 1978. There were 2 lightkeepers on the island and during the ferocious storm, the lightkeepers quarters, the supply building and the boat house were completely blown off the island. The keepers had to take shelter in the lantern room itself until they could be rescued via Coast Guard helicopter a day or two later. As the storm raged, granite blocks in the light cylinder were knocked out of the structure and thrown into the sea. After the blizzard, the light was repaired, and a large solar panel supplies power to the light today. The island is 700 feet by 300 feet, 15 feet above water and only has the light itself, the solar panel, a generator / power building and the few remains of the lightkeepers quarters. 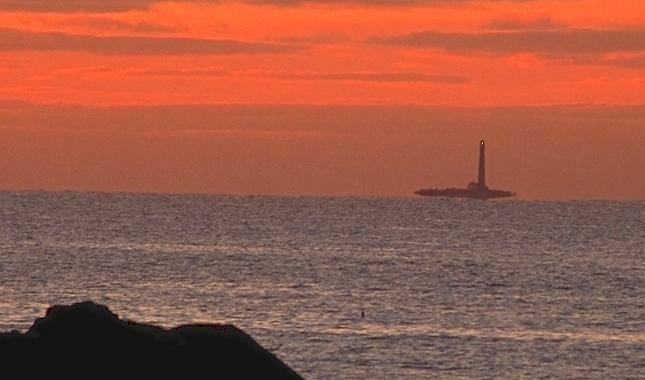 Boon is 9 miles offshore from York Beach, where this photo was taken. The light can be seen from Cape Neddick.